Did you know that Fika is coffee said backwards? 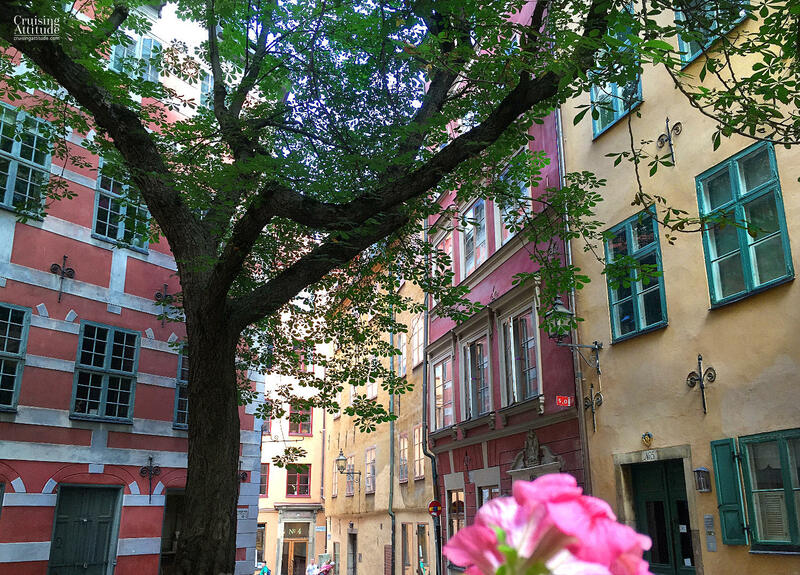 This café is located in the “oasis” in Gamla Stan, a little square called Brända Tomten. If it’s a hot day, the chestnut tree in the square will seem to call out to you to sit under the its shade-giving leaves. Under Kastanjen (Under the Chestnut Tree) serves all kinds of hot and warm drinks, pastries and light lunch. The lunch selections run from fresh salads to soup and sandwiches. They also service a daily lunch special. Possibly the most famous bakery in Stockholm, the pastries and cakes here are just a little too tempting. It’s a dangerous place for the waistline! 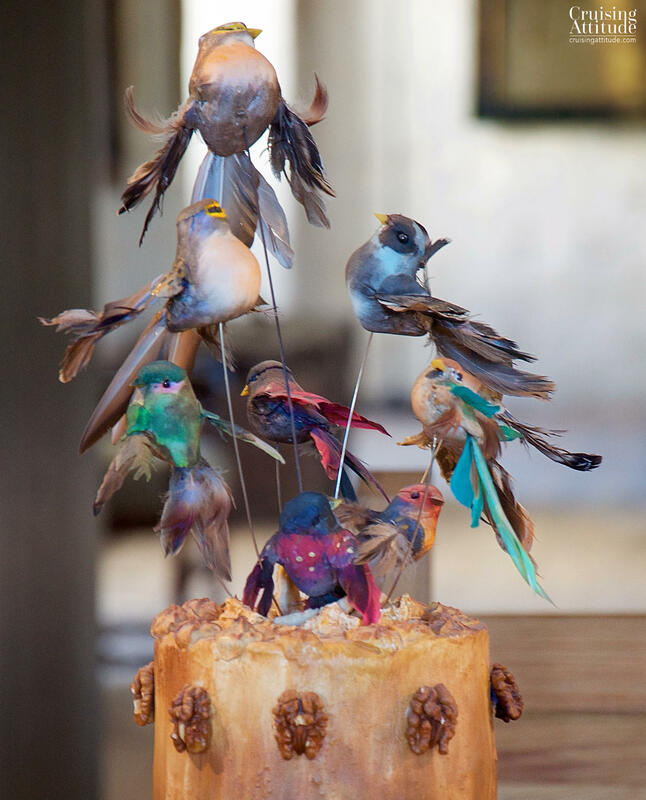 It was founded back in 1920, and has taken quite a few prizes in various pastry-chef competitions. If you are really into beautifu, old-school kinds of pastry/coffe shops, you’ll love Vette-Katten on Kungsgatan. It was founded in 1928 and frequented by Grete Garbo. In addition to the delicious pastries, cakes, bread and biscuits, light lunches are served between 11.00 and 14.00. Sture Katten is not at all like Vete-Katten and there is no connection, save for the word “katten” (the cat) in their names. Sture Katten is like going back to your great grandmother’s house. The pastry shop is laid out on three different floors of a building that dates back to the 1700s. Each former apartment in the building is a group of small dining rooms at Sture Katten. Each dining room is different and even the plates and glasses are different — it really feels like visiting three different apartments. It’s beyond cosy! I used to come here quite often for a dose of “hygge” when I lived in Stockholm. Café Ektorpet is an old coffee house hidden amongst the trees and flowers close to Print Eugens Waldemarsudde (a beautiful art museum). They are noted for their “våfflor”, a kind of waffle, lighter than then Belgium or American versions, heavier than the french one. In addition to pastries, cakes, våfflor, and ice cream, they serve a couple of daily lunch specials. “Simple, but delicious typical swedish food” is how we describe it. 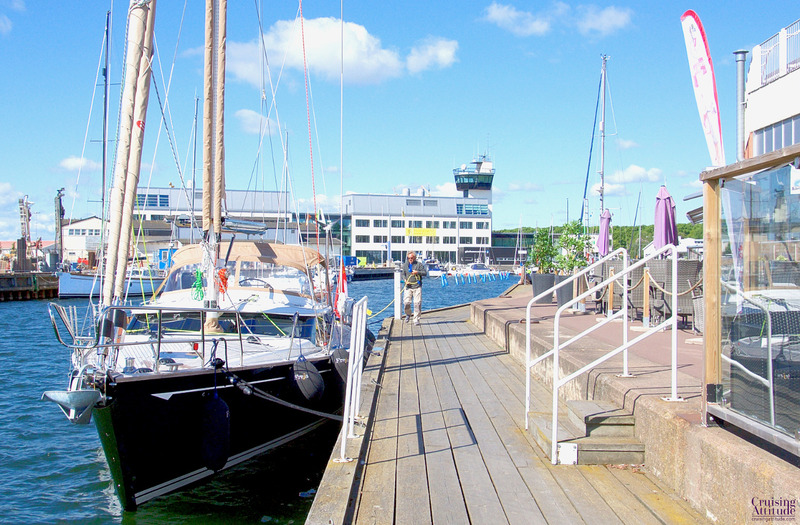 During the summer, the café moves outside, and you have a wonderful view of the sea leading in to Stockholm as well as of the Navishamn marina. Rosendals Trädgårdscafé is well-loved by the locals and tourists alike. It’s placed right in the middle of a series of greenhouses selling plants and flowers. It’s wonderful for a fika, but you can eat a light lunch (between 11 and 14.00), a sandwich, or a bowl of soup if you’re hungry. All of the food, including the cakes and pastries are certified organic. All of the bread, biscuits, pies and cakes are baked in their own wood-burning oven. There’s even a little farm shop! 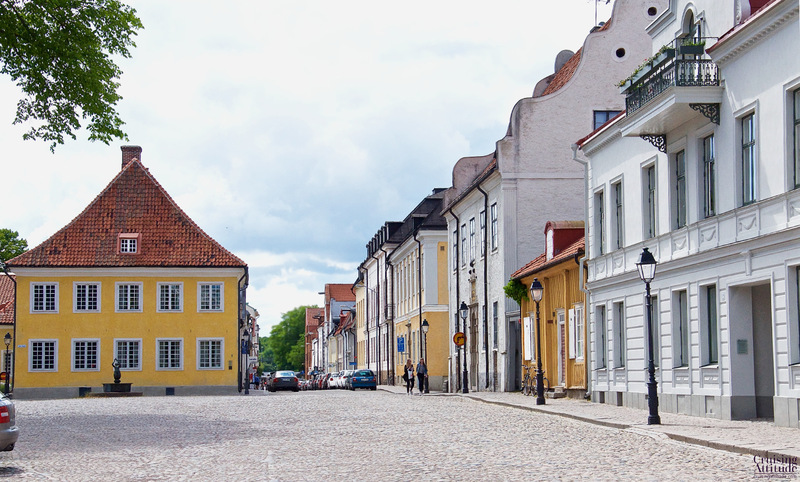 It’s not far from the Navishamn — a 10-minute walk. 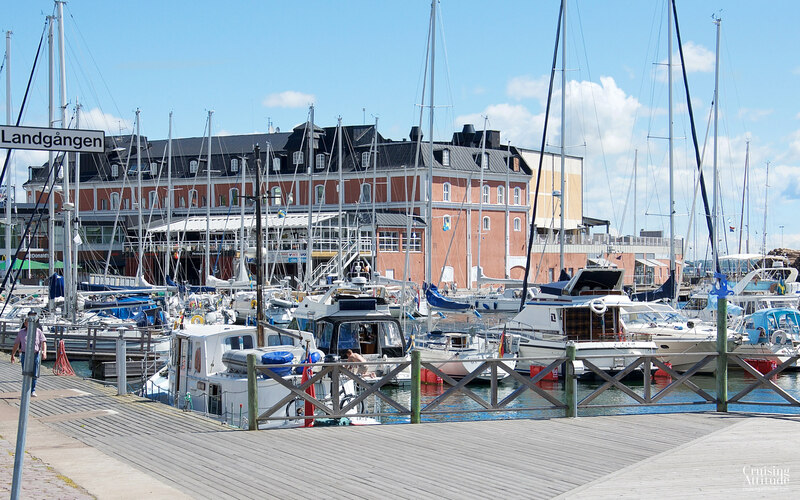 If you’re staying at the Wasahamn marina, you can take the tram towards Waldemarsudde and get off at the “Bellmansro” stop. From there, it’s about 5 minutes’ walk. This is yet another of Stockholm’s elegant tearooms. Svenskt Tenn is a home decorating shop (Swedish Design!) with its own tearoom. The best thing about Svenkt Tenn is it’s mini side-walk café/ice cream shop during the summer. It really is the best ice cream in town! Each day, you can chose from 5 or 6 flavours in the ice cream cart and it’s served in either a cone or a bowl. We were told the ice cream is hand-made in small batches by a mom and pop-style company on the island of Kungsholmen. Since the weather was sunny and warm almost every day during the month we spent in Stockholm, we were there at least 15 times. That’s a lot of ice cream tasting. We saw this beautiful super yacht across the water from the sidewalk café at Svenskt Tenn (yellow building with green awnings). 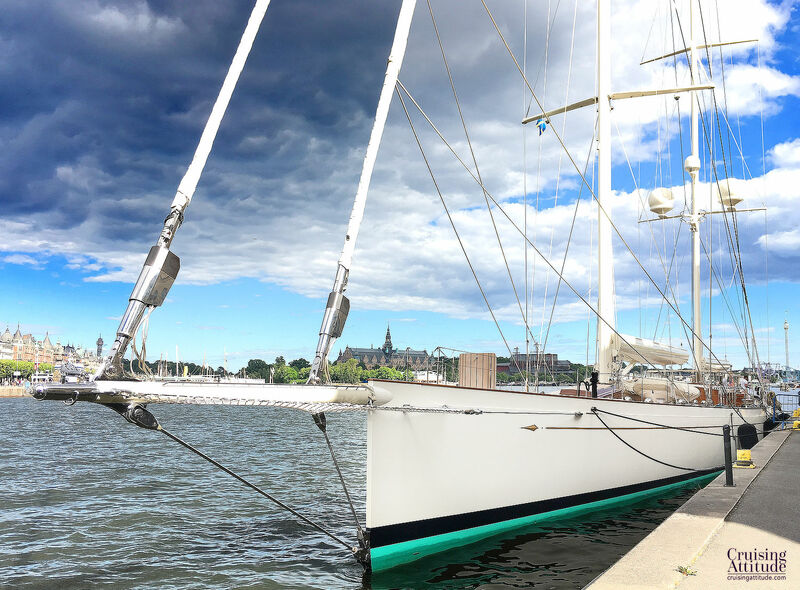 We saw this 55 meter-long Royal Huisman as well – so impressive! This café/restaurant/bakery is housed in a building from the 1600s at Stortorget (The Big Square) in the Old Town. Skip all of the tourist trap cafés at the Stortorget and come here. The Grillska Huset serves organic, home-made food (you can buy bread, biscuits, pies and cakes in the bakery part of the building. We bought lots of their knäckebröd (for me) and cinnamon buns (for Jacques) to stock in our galley. 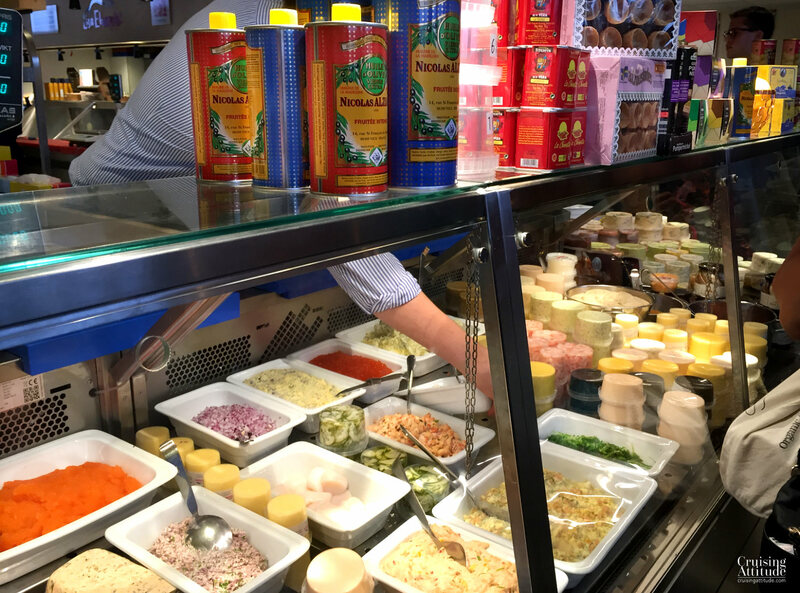 In addition, the Grillska Huset is run by a official charity called Stockholms Stadsmission, so you’ll be doing good by eating or buying here. For Stockholm’s best views, go to the Kaknästornet. After walking around the tower with your camera/phone in hand to take photos, you can relax in the Sky Bar. We had a glass of wine and then coffee (it was late afternoon) while enjoying the amazing view. If you’ve been shopping at the Östermalmshallen (and it’s really worth a visit), you can take a break at Robert’s Gourmet Coffee. We enjoyed cappuccinos and Jacques and our visitors some delicious cinnamon buns (called kanelbullar in Swedish). Ride your bike (or rent a bike) around Djurgården. We rode from the Navishamn out to the eastern end (Blockhusudden), then back along the canal. 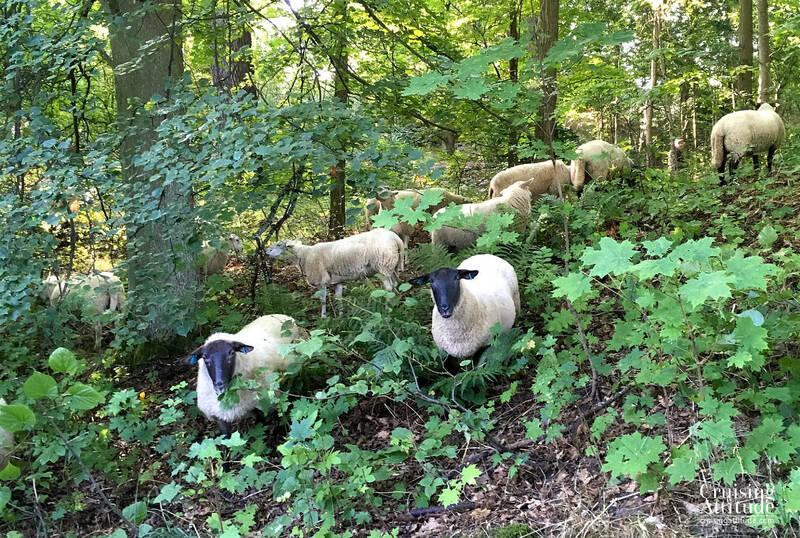 We came across the “King’s sheep” while biking through Djurgården. The shortest tour would be to do a “tour de canal” ride and the longest would be to ride along the shoreline and come back on the “other” side (the Gärdet side) and back over the Djurgård’s bridge. You can rent a bike at the Durgård’s bridge. 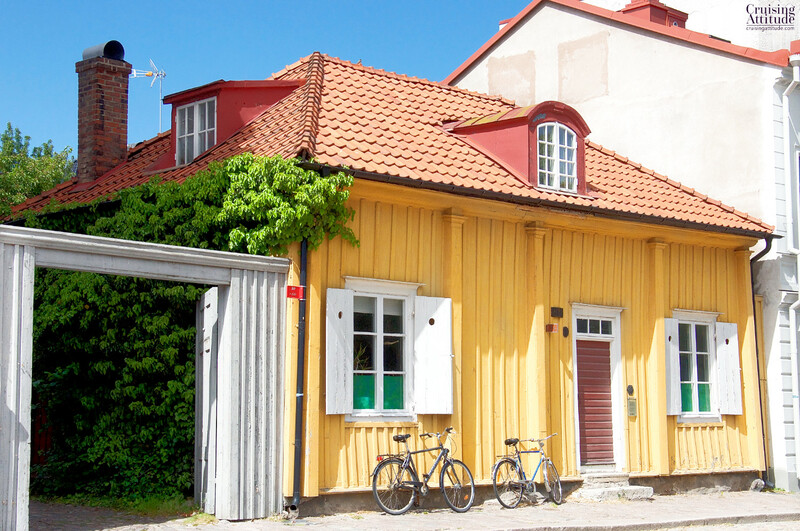 For a really great tour of the city, ride your bike into the centre of town, then along Södra Mälarstrand. Continue over the “Västerbron” bridge and then back along the Norr Mälarstrand. 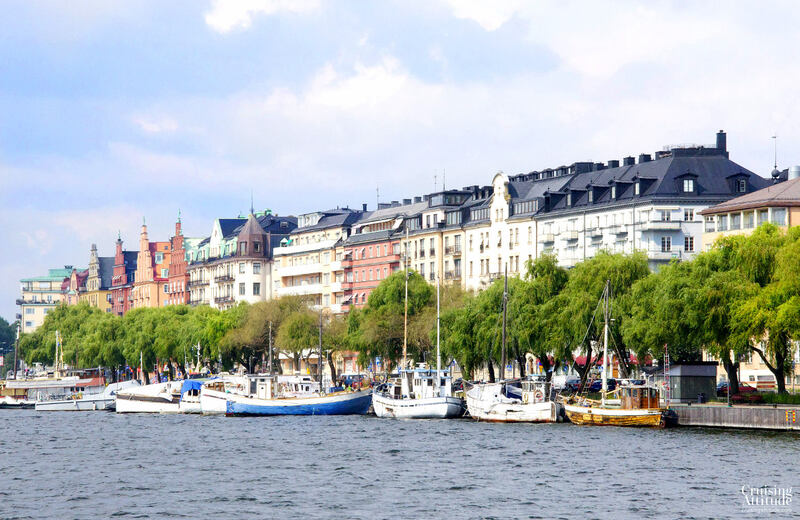 You can ride over Slussen (the locks) and then catch the ferry to either Kastellholmen or Djurgården from Gamla Stan. You’ll pass lots of places for coffee or a meal along the way. And you’ll pass lots of photo opportunities, so pick a beautiful sunny day. 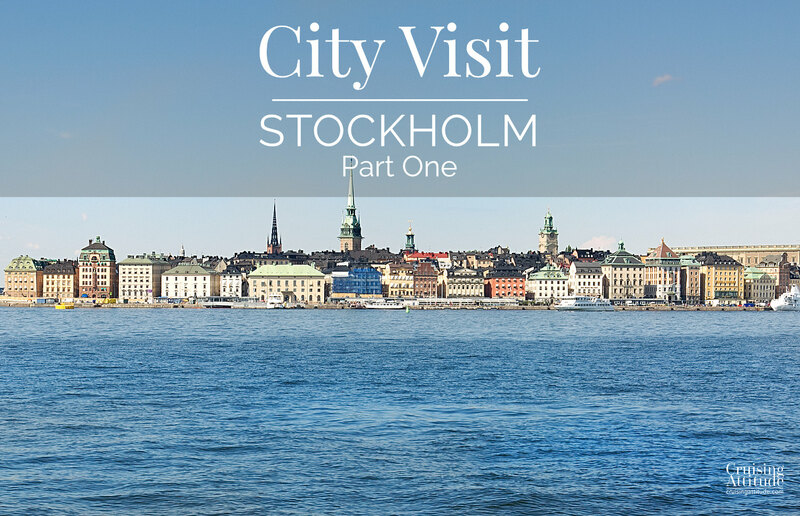 I used to do this tour often when I lived on Södermalm, near Hornstull (minus the going to Djurgården part). Go for drinks, perhaps even a meal and a wonderful sunset view over Stockholm. Mossebacken Terrassen is located high up on the cliffs of Södermalm, providing a great view of the city. It’s open during the summer only. Check the website for opening times (depends on the weather as it’s outdoors). Rent a kayak and paddle Stockholm. You can rent kayaks at the Djurgård’s bridge, so it’s just not far from the Vasahamn marina. It’s great fun to paddle the canal. Strandvägen has lots of cafés/bars along its waterfront. We tried a few during the warm summer evenings as we’re always up for a glass of wine. 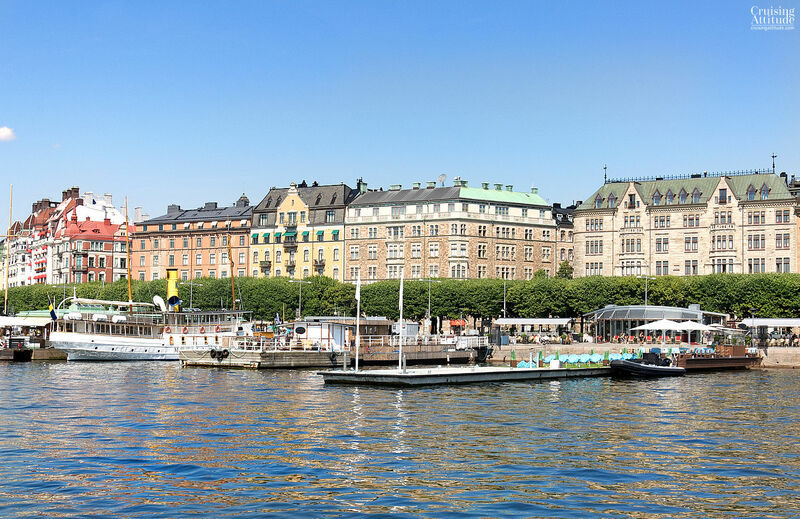 You really can’t go wrong when you have the beautiful view of the Stockholm waterfront right in front of you as you sip your favourite drink. Here you can see some of the “sidewalk” cafés along the Strandvägen Waterfront. The area around Fjällgatan (means Fell or Mountain street) is a great place to visit. The low-slung row-houses lining the cobblestone streets were once housing for the working class back in the day. 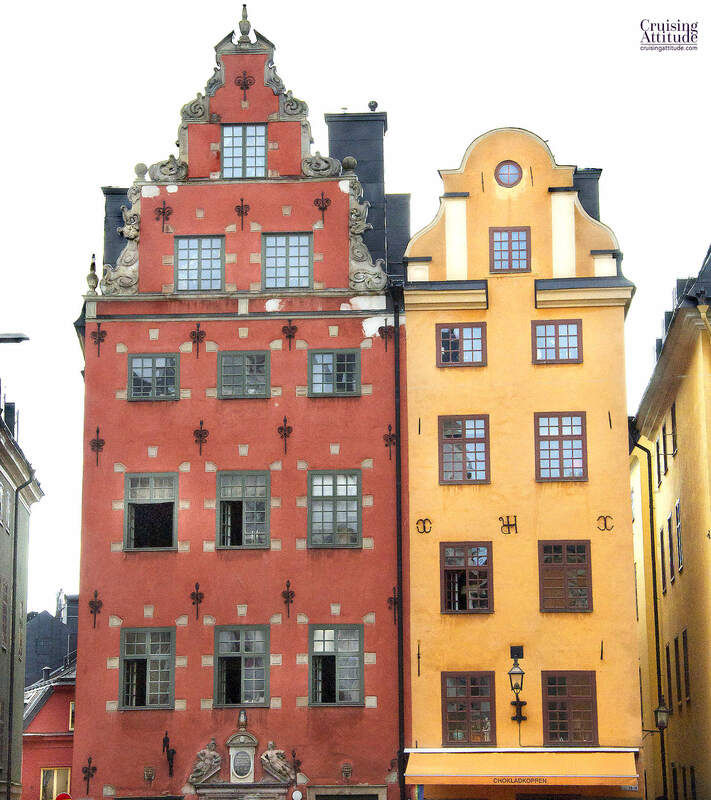 They are now some of the most expensive apartments on Södermalm. The view from Fjällgatan is so amazing all the tourist busses stop here on their site-seeing rounds. If you’re hungry or thirsty the famous (in Stockholm) Herman’s vegetarian restaurant is here. Otherwise, there’s a small café, Fjällgatan’s Kaffestuga. This is a relatively new restaurant and bar in a “skyscraper” that used to be where the tax authorities worked. The building is known to the locals as the Skatteskrapan (taxscraper). The restaurant and bar are located on the two top floors — the 25th and 26th respectively. Because the other buildings around it are much lower, the view is incredible. Have a look at the website for photos of the view. 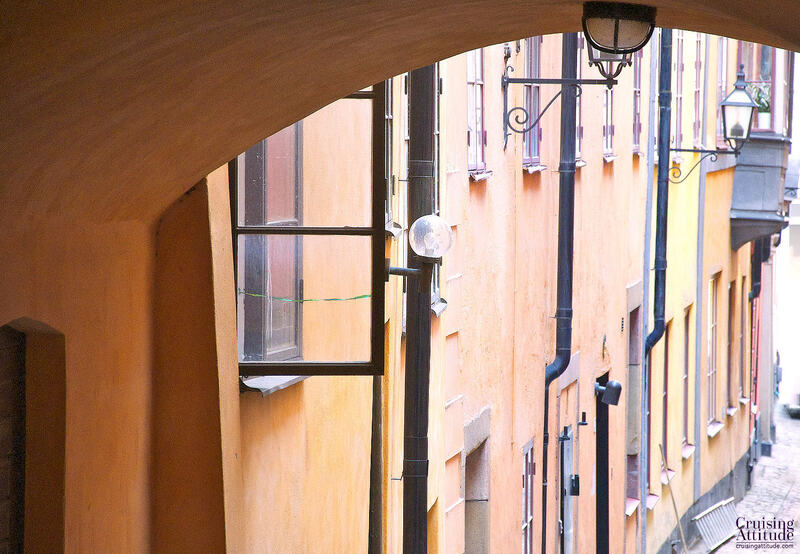 Have a look at Stockholm with an “Under the Bridges of Stockholm” tour. These are run by the Stromma Turism company. We took both of the couples who visited us (friends and family from Switzerland) on this tour and they all loved it. Even though we’ve done several times, we love as well. 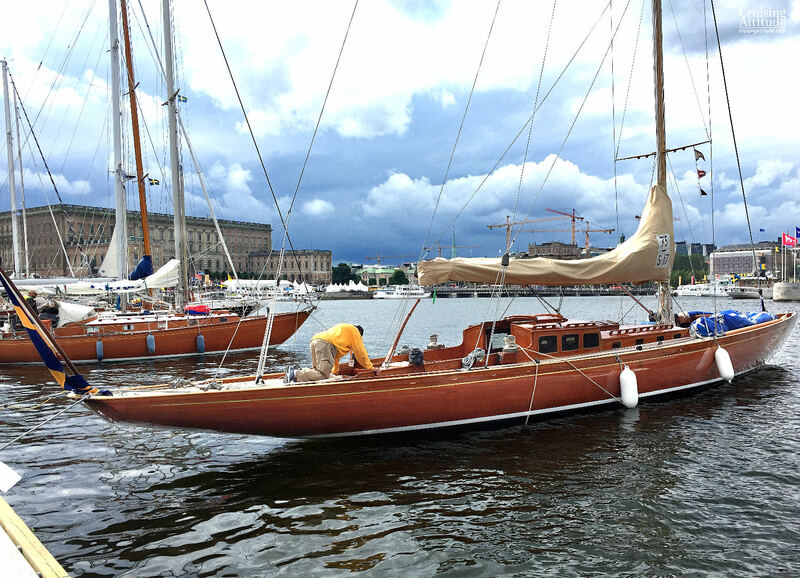 You’ll see a lot more of Stockholm by boat in an couple of hours than you will walking or riding your bike in a week. And you’ll see places that you probably would never have visited otherwise. Go swimming like the locals at the beach called Smedsuddsbadet in Rålambhovs Park. This is the most well-loved beach in town, and on hot sunny days it gets really crowded. It’s on the lake side of town so you’ll be swimming in fresh water — no need to rinse the salt off! This little group of islands hosts seven different cafés/restaurants, several different artisans (glass blowers, painters, potters, textile artists, etc.) a smoke house for smoking fish, and lots of choice picnic spots. 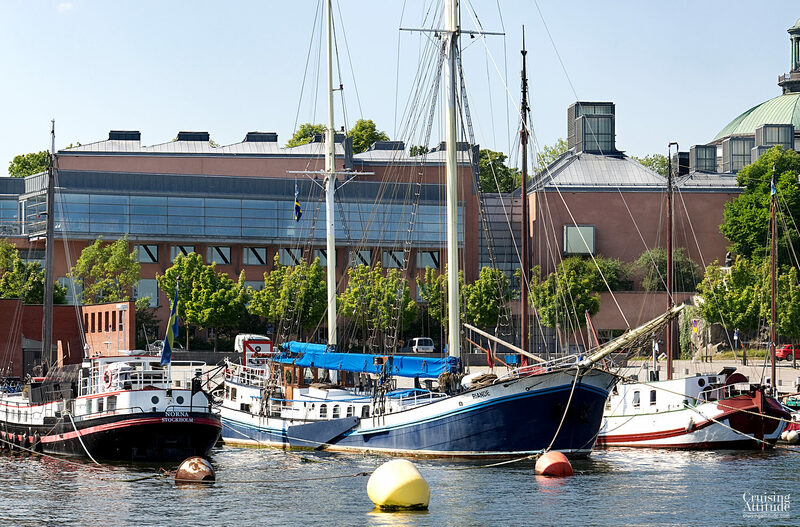 If you do sail over to the Fjäderholmarna, be warned that the marina is small and there aren’t many berths, so call ahead to reserve or see if there’s space (+46 8 716 39 10). The “decoration” at Oaxen Slip. Impressive! Oaxen is two restaurants – one is an upscale gastronomic experience with 2 Michelin stars (Krog). The other, called Oaxen Slip, is a more relaxed version of the Oaxen Krog , with the same localvore, organic philosophy. We had dinner at the Oaxen Slip. Unfortunately (or perhaps fortunately for our wallets) the Oaxen Krog was closed for the summer holidays. It was a beautiful sunny evening, we were seated at the best table on the terrace and we were with friends, so we ordered the entire gamut from snacks and wine to first course and main course, and finally dessert. If we were to label the type of food it serves it would be “upgraded and revisited Scandinavian”. Everything was outstanding, including the service! A warning: since both of these restaurants are so popular, you’ll need to reserve a table — for weekend evenings, a couple of weeks in advance. They have on-line reservations. The Strandbryggen is a hip and friendly outdoor restaurant and bar, built upon a pontoon at one end of the Djurgårdsbron(Bridge of Djurgården). 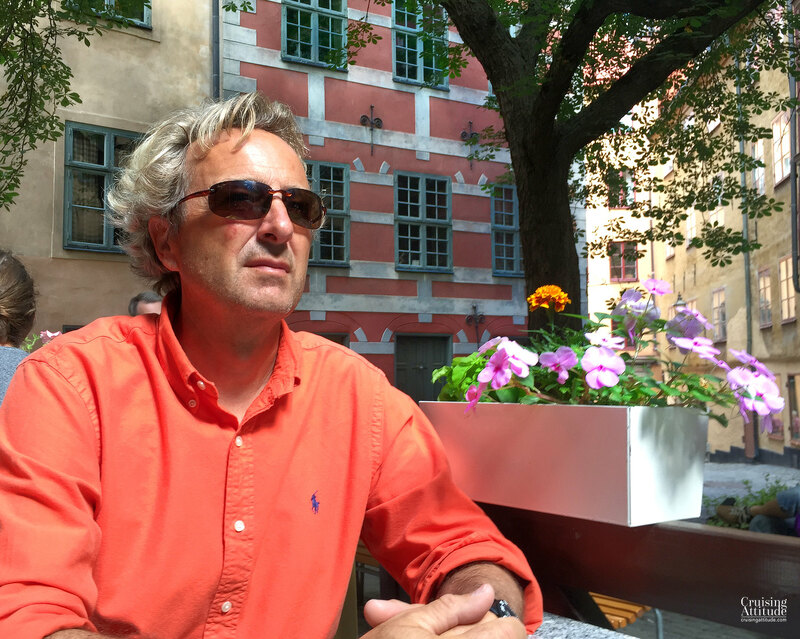 As we had non-stop sunny days in Stockholm, we had both lunch and dinner there several times. It’s a great place to have a glass of rosé in the late afternoon as well. It can be really full on Thursday and Friday evenings when they have their “after-work” parties, though. If you’re there in July, there won’t be any after work parties as everyone’s on holiday, but if the weather is sunny, it will be full, especially the bar area. The lunch menu is usually composed of 4 or 5 items as main courses. You order at the counter and are given a beeper when your dish is ready. You then fetch your lunch from the kitchen window. In the evening you can chose between the “self-service area on the left, and the table service area (slightly more expensive) on the right. While Cultur is a “normal” restaurant at lunchtime, in the evening it really impresses with its fantastic mouth-watering tapas dishes. It has a fun, bohemian atmosphere. Order four or five tapas dishes and you’ll have had a wonderful dinner. The wine list (many wines available by the glass) is equally impressive. 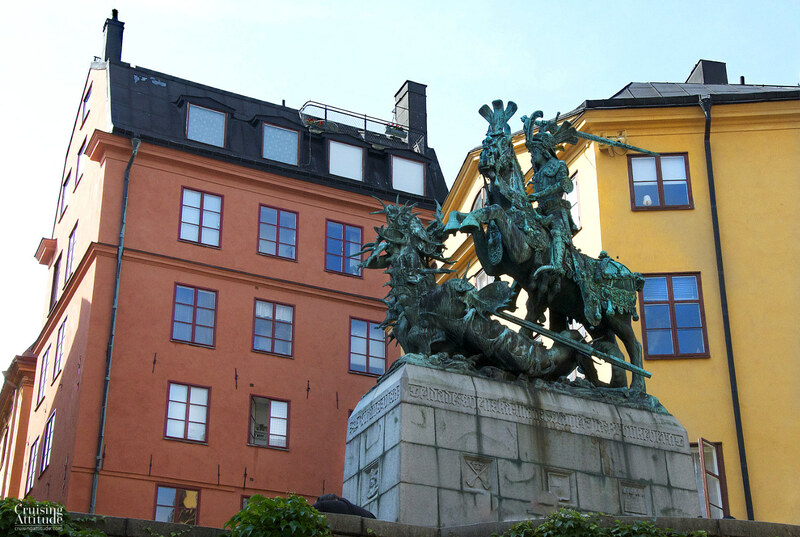 A view of Gamla Stan (St. George and the dragon, just a stone’s throw from Cultur Restaurant and Bar. 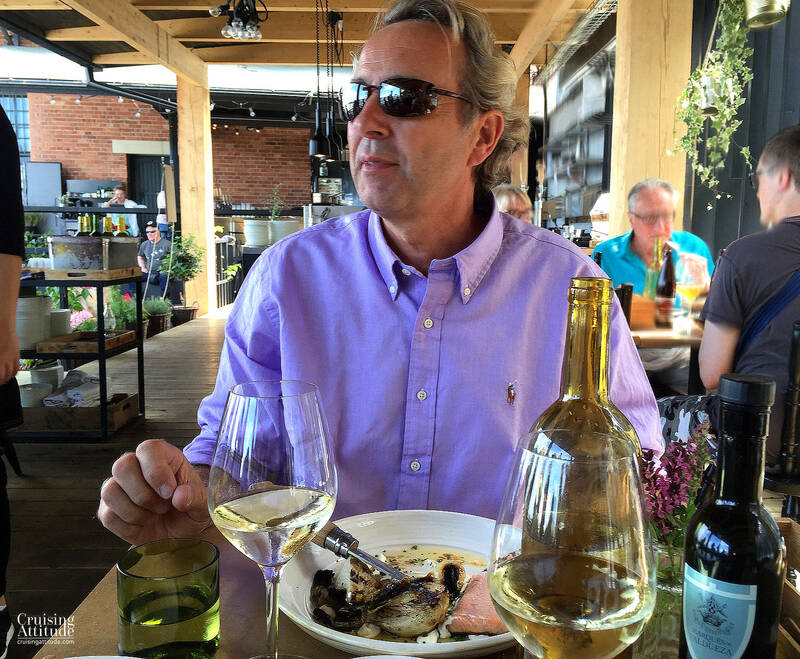 This fish and seafood restaurant is part of Östermalmshallen, an upscale food market just a few tram stops and a short walk from Djurgården’s marinas. The quality is impeccable, the service is friendly and the wine list is interesting. You’re starting to understand that wine is important for us! Our favorite dishes are the typical Swedish “rimmad lax” and their version of “Toast Skagen” (open-face shrimp salad and caviar sandwich). The restaurant at the Fotografiska moves to the outdoor terrace during the summer. It’s a restaurant that puts the vegetables in center stage, not the meat or fish. When you chose your dish, you chose a couple of vegetable “creations” (we’re not talking about a helping of broccoli or spinach just dumped on your plate) and then chose a meat or fish to go with them. A nice change of pace, we thought. And it’s a festival for the eyes and palate. Restaurant at the Fotografiska, under the pergola. We had lunch here twice during our stay in Stockholm. If the weather is nice, meals are served on the patio with a lovely view of the old town and the Royal Castle across the water. The setting and the look of the restaurant is what attracted us to the restaurant in the first place. At quick look at the menu and we were asking for a table. I figured that if it was managed by the Grand Hotel (the Grand Dame of all of Stockholm’s hotels), it can’t be that bad. The price level at this bistro-style restaurant was far below one would pay for a meal at the Grand Hotel itself (2 Michelin Stars). Towards the late afternoon, the place turns into one of the “in” places to have a drink. This restaurant is possibly the most zen of all the restaurants in Stockholm. The change in vibe when you walk through the entrance is immediate. Outside, you have the noisy, crowded area around the Abba Museum with crowds of people walking towards the various attractions on Djurgården. Inside, the tranquility will almost startle you. The courtyard, with it’s huge trees provides shade on sunny, hot days and various plants and flowers placed all around the restaurant provide a lovely backdrop. The atmosphere at Mälarpaviljongen is similar to that of Strandbryggan – hip, fun, and on the water. The food is simple, but good. 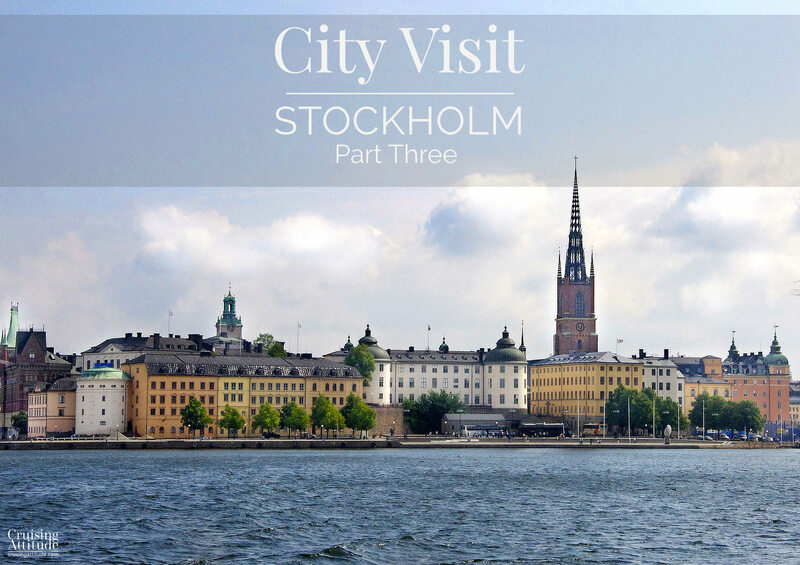 Go for the atmosphere and beautiful views of the lake and Södermalm island. Come early for lunch or dinner, as it tends to be packed on warm summer days and evenings! Tradition serves typical Swedish food — the sort of grandmother’s recipe food —but seriously upgraded to a gastronomic level. Most of the old swedish dishes can be labelled “comfort food” — think dairy, potatoes, cabbage, onions and other vegetables that can grown in northern climates, local varieties of fish and meat. For dessert, blueberries, strawberries, cloudberries and apples. That makes sense if you reflect on what was available here before food began to be shipped all over the world. Tradition is a wonderful experience, especially if the weather is grey or cold. This is Stockholms best and possible biggest department store. We found lots of small things “for the boat” – mostly for the galley. Here are some of them: some Eva Solo thermos coffee mugs, a gorgeous Holmegaard candle lantern, a few kitchen utensils. Clothing was on sale, and Jacques found a great pair of sailing pants from Pelle P. Note that the sales in Stockholm run during July and August. It’s a great place to find small “typically swedish” gifts for family and friends. This is a smaller version of the Illums Bolighus in Copenhagen. We found two Muuto baskets that fit perfectly in the boat, behind the sofa. I found a wonderful pair of black mesh slip-on sneakers by Ilse Jacobsen, one of Denmark’s most well-known fashion designers. An on sale for 50% off! Have you seen those granite “ice” cubes for drinks? Bought those here as well. The advantage of putting granite “ice” cubes in your drink is that it doesn’t melt and water down your drink. You keep them in your freezer and when introduced into your glass of white wine, it keeps the drink cold for about 20 minutes. 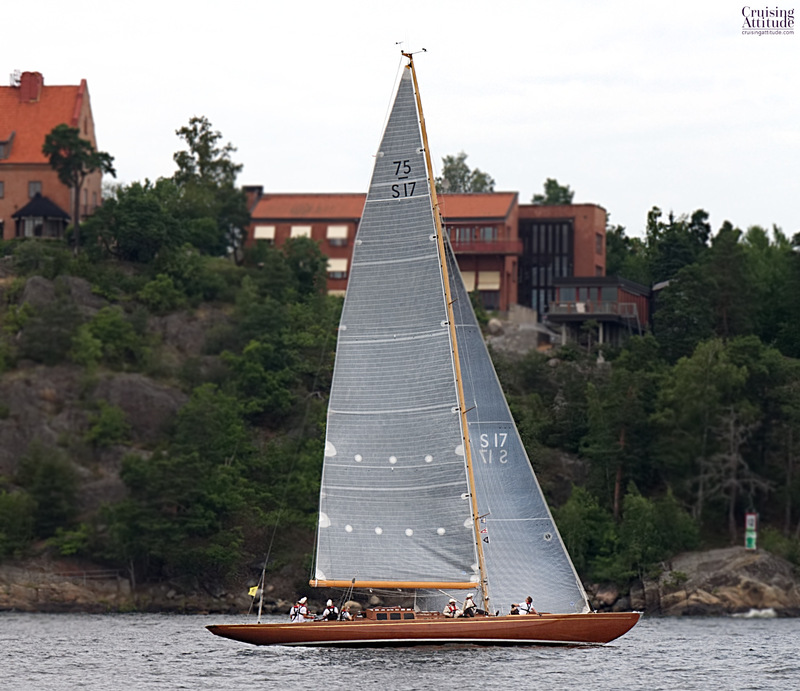 We love the Swedish brand Sail Racing! The problem is that it’s expensive. Solution: visit Sweden in late July-early August and everything’s on sale. Including Sail Racing. It also helps to suggest an “early birthday gift”. We both walked out with a SR down jacket, bought on sale for 40% off, both as late and early birthday gifts. This is a bicycle shop for those of us who cycle for transportation, not for competition. It has a vintage, hip and cosy atmosphere. Best of all — for us — it has a Brompton department! Jacques had a slow puncture in his front tire and had it repaired during our afternoon stroll through the Old Town. We also picked up a few Brompton accessories like rain covers for our shopping baskets. It’s amazing how many other cruisers we’ve met so far who have Bromptons. They do fit into very small places. We bought tons of Skagen Röra here (a Swedish shrimp salad) during our month-long stay. As you may know, everyone make their own version of this, and Lisa Elmqvist takes the silver medal in the Skagen Röra competition ( in our humble opinion). Larsson’s Fisk in Mollösund takes the Gold. 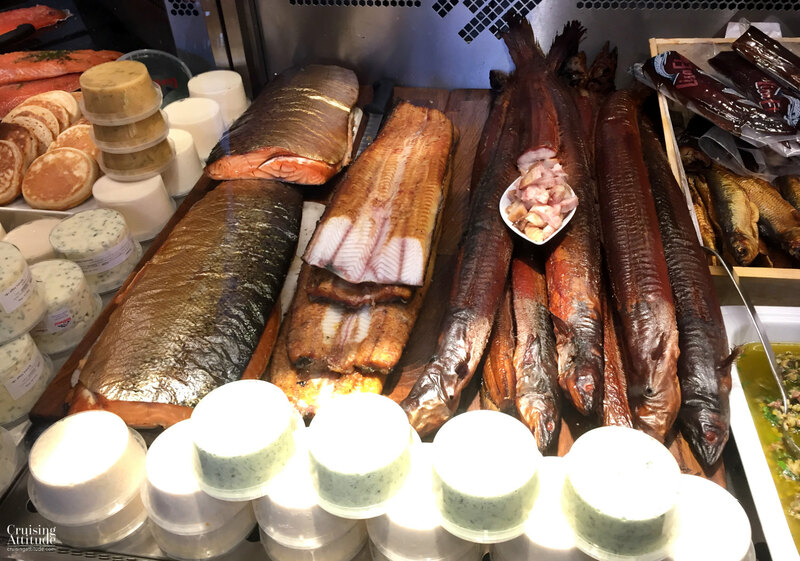 Also warmly recommended: their quiches (especially the chanterelle and the shrimp), the smoked eel, the flounder and all of the variations of salmon (gravad, rimmad, smoked). Hand-churned butter anyone? How about some good Parma ham or even Pata Negra from Spain? 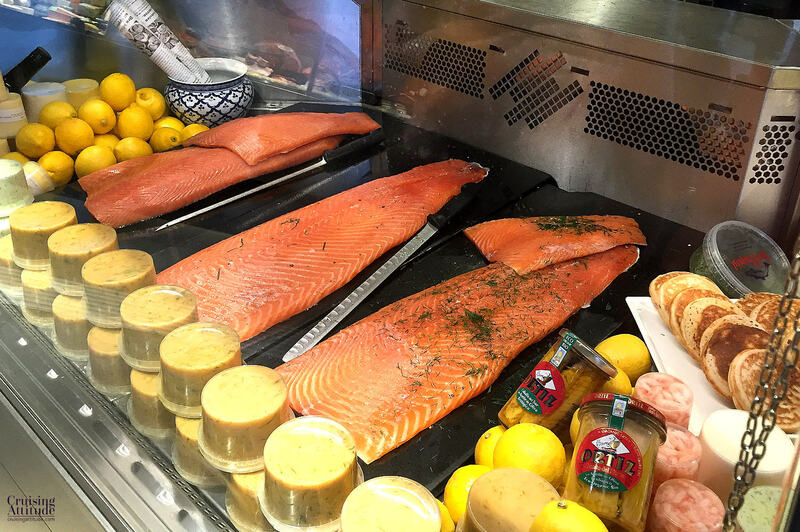 This deli has so many mouth-watering foods it’s difficult to chose. We bought some balsamic vinegar, olive oil, sauces, and Swedish reindeer and Elk sausages. We bought some well-aged steaks here for each time we had visitors. So delicious! And they almost melt in your mouth. The service is fantastic! This is a wonderful place to buy some unique, inexpensive, yet not at all kitchy gifts for family and friends at home. They have a range of hand-woven and hand-sewn textiles. We picked up some table mats and table runners for future Christmas gifts for friends. This is the closest chandlery to both marinas. They have two stories of boat supplies, parts, charts and clothing. The service is excellent! We had to order part of a bow ladder that we lost to the sea. It arrived in just 2 days. ICA Esplanaden on Karlavägen – not far from the marinas if you have a bicycle – they have a great selection. ICA Quantum Värtahamnen – this is a really big ICA. You have the biggest selection here, but it’s a 5-kilometer bicycle ride away. It’s really only for those with a bike or who are willing to take a taxi/Über to get groceries. We were groaning under the load of backpacks and overfilled bicycle baskets. ICA in the basement level of NK – this ICA has an excellent of selection of gourmet food, but doesn’t have a great choice of some ordinary things like toilet paper and cleaning products. The advantage is that the tram stops right in front of the store — so you won’t have to lug your heavy grocery bags too far. Hemköp in the basement level at Åhléns. The Hemköp chain of grocery stores is just as good as the ICA, its just not as easy to find. The one at Åhléns has a good selection of just about everything you’d need. As you may know, Sweden, like Norway and Finland has a monopoly on the sale of alcoholic drinks. You need to go the “System Bolaget” (green sign with yellow lettering). There are many retail outlets in Stockholm but the one closest to the marinas is at Karlavägen 100. If you have a bike with a large basket, it’s perhaps a 10 minute ride. If you don’t have a bike, a better alternative is the System Bolaget next to the NK, since the tram will take you door-to-door — something you’ll want if you’ve purchased a case of wine or beer! You can’t taste anything at the System Bolaget, but there are written descriptions (at least on the wine — but only in Swedish). When in doubt, ask the personnel — they seem to love giving advice (at least about the wines). I hate using the word “attraction”. It sounds like I’m referring to a theme park like Disneyland. But the places that I cover in the post are attractions because they attract enormous amounts of visitors. So think of them that way and not the “Disneyland” way. 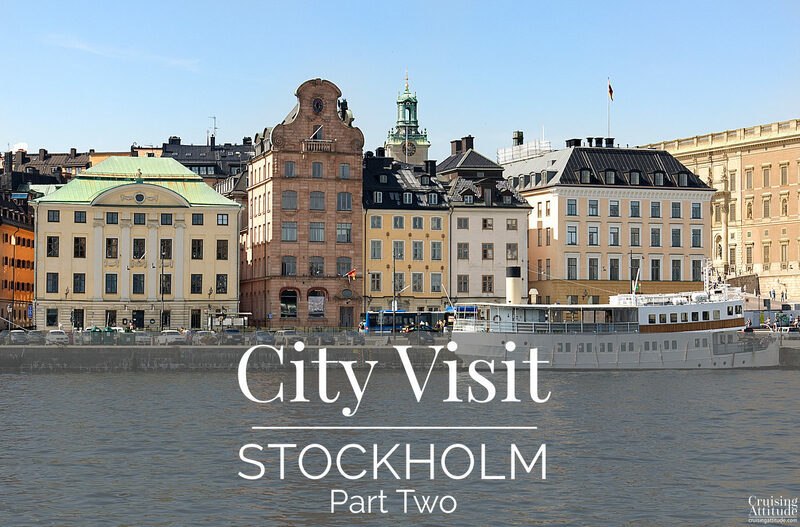 If you’ve never been to Stockholm, you can buy a “Stockholm Pass” that gives you entry to 60 top attractions, including most of the ones on the list below. It also includes rides on the sightseeing buses and boats. If you think you’ll be using a lot of public transportation (no bikes oboard or don’t think biking is much fun), you can also buy a travel card for 24-72 hours. See this site for all of the ways to pay for public transportation. There’s even an app for that! Please be aware that you can’t buy tickets with cash or credit card, so have a look at the site. Jacques and I bought the SL Access Cards that you charge with money at special charging stations (like an automatic teller machine). Nr. 1: The Vasa Museum. I won’t go into excruciating detail on the Vasa Museum (you’ll find pages of descriptions on various websites including their own). But you just cannot miss this museum if you come to Stockholm. It is Scandinavia’s most-visited museum and the only preserved 17th-century ship in the world. 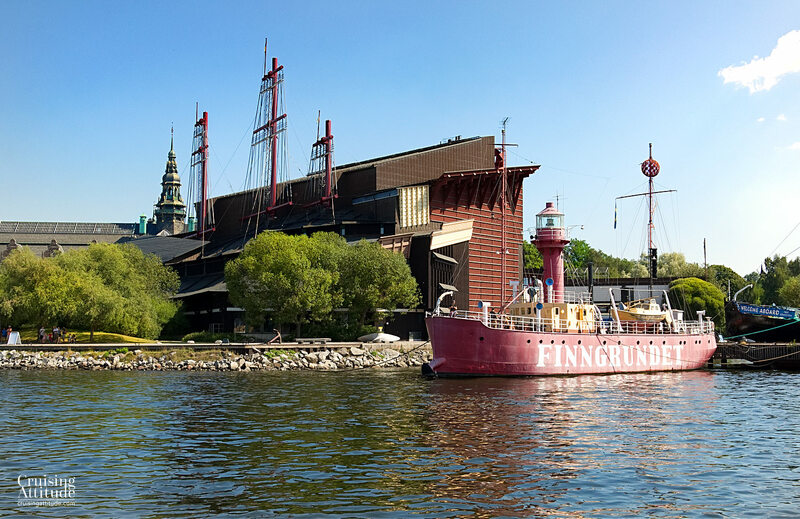 The best part about the museum, besides the ship itself, are the exhibits showing you the lifestyle of Stockholm in the 17th century – how people worked and lived — with dioramas and special effects. A view of the Vasa Museum from the water. In the foreground you see the old lighthouse ship “Finngrundet”. 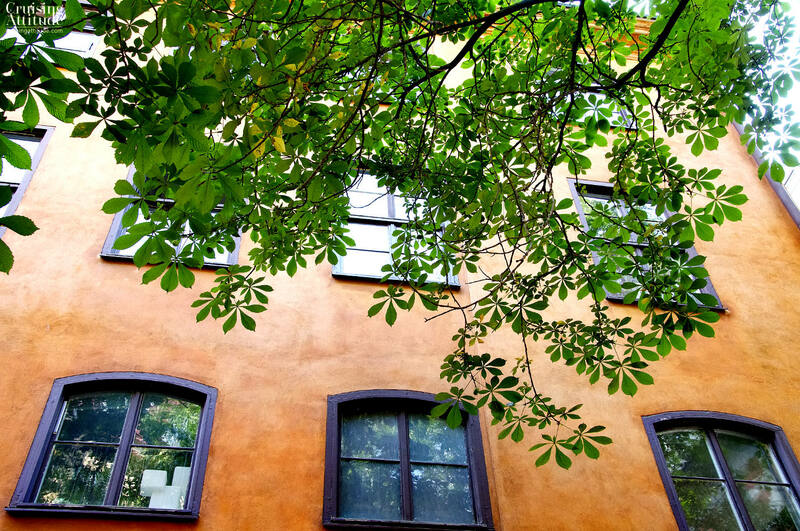 The open-air museum of Skansen shows you, in real life, the swedish lifestyle throughout five centuries. 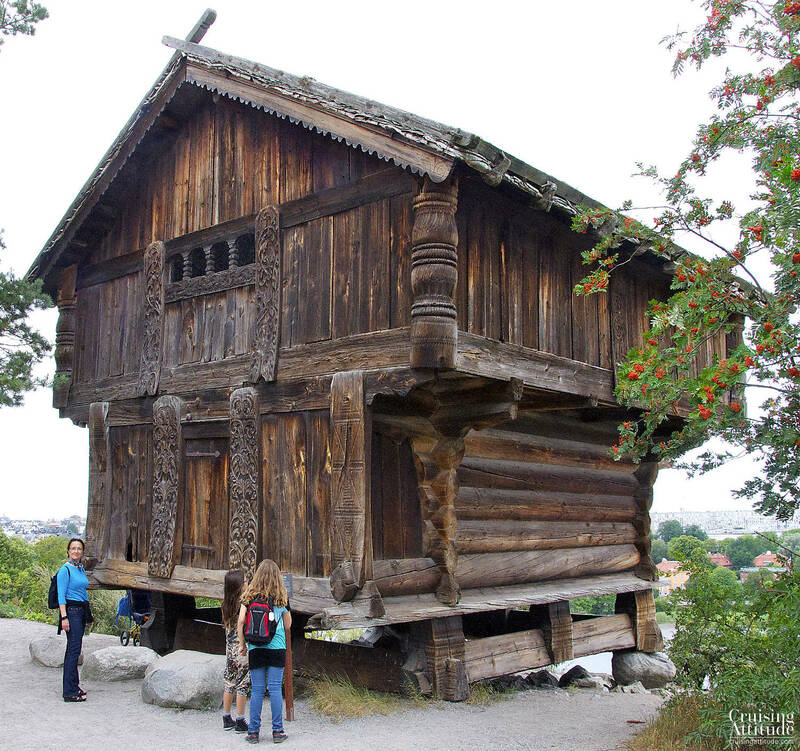 It was founded back in 1891 and consists of real buildings and houses that were found all over Sweden and moved to the site of Skansen. You see working glass-blowers, millers, bakers, carpenters, etc. from the time period of the building they occupy. 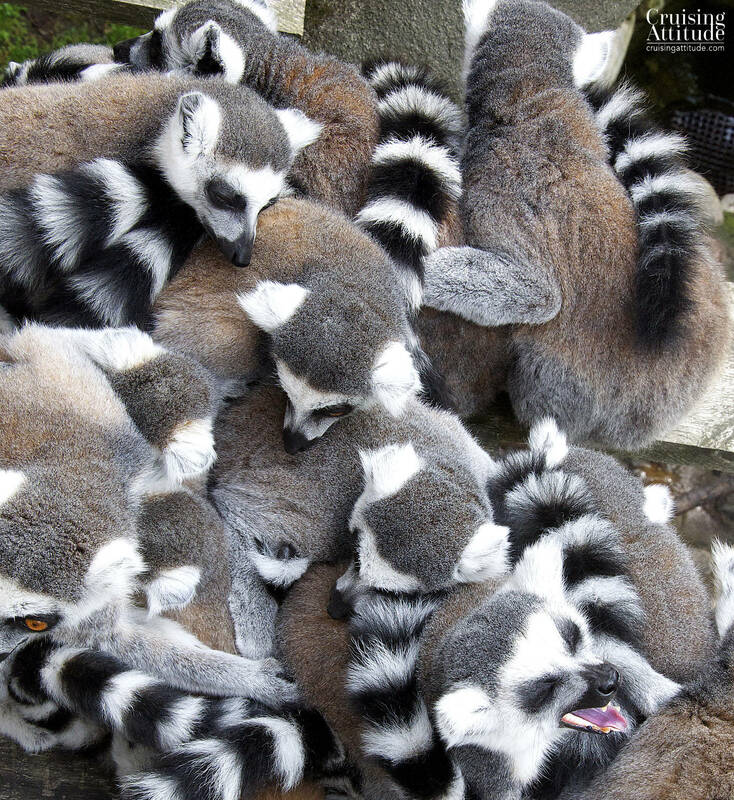 Skansen also has a small zoo featuring the animals native to Sweden as well as a small aquarium. We love it! The Medeltidsmuseet (Medieval museum) is similar to the Wasa Museum in that it features a series of buildings and rooms depicting life (in this case, life during the middle ages in Stockholm). It’s not just a series of glass cases with artefacts — it’s an almost real-life exhibition. 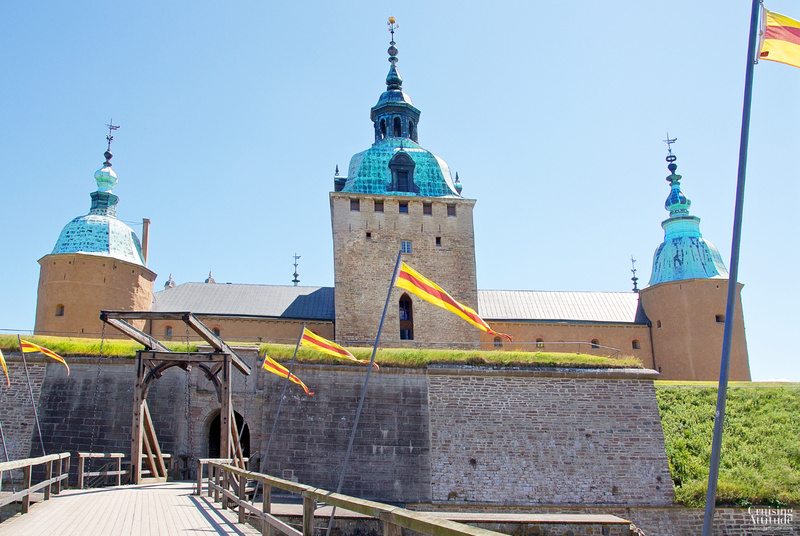 The museum is built around an actual excavation and began with the discovery of the ancient town wall of Stockholm, built in the 1500’s. Free guided tours in English: Tuesday–Sunday at 2–2.30pm (July–August). 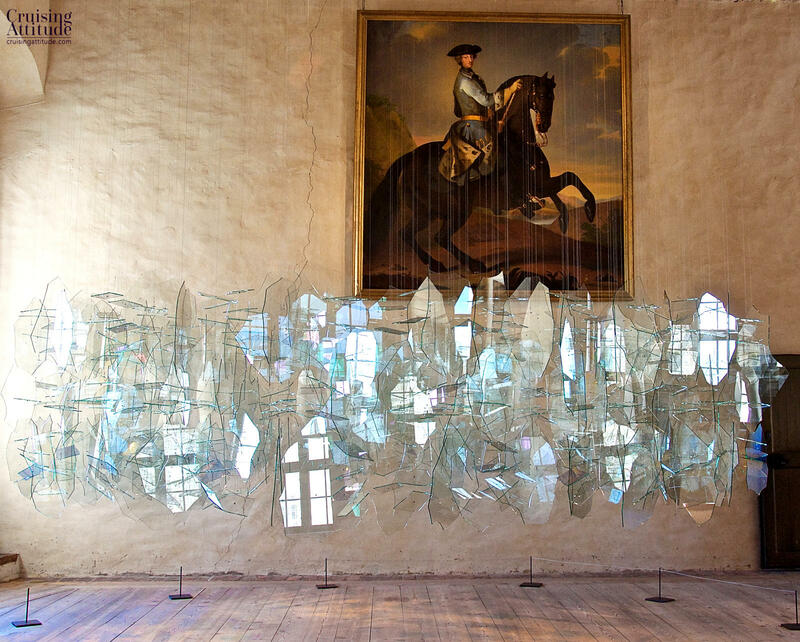 If you enjoy modern art, you’ll have to visit the Stockholm Museum of Modern Art. It has one of the biggest collections of modern art in Europe. 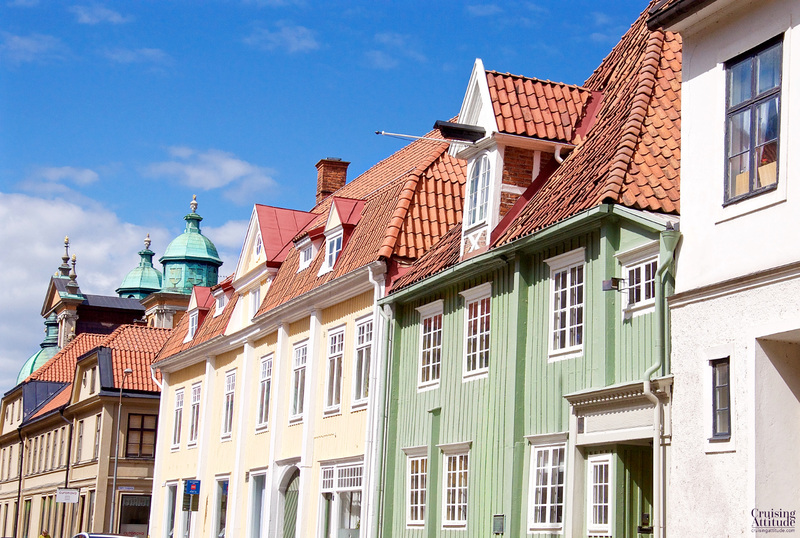 It’s located on beautiful Skeppsholmen, worth a stroll or bike ride in itself. If you’re hungry while you’re there, the restaurant/café is quite good. View of the Museum of Modern Art from the water. 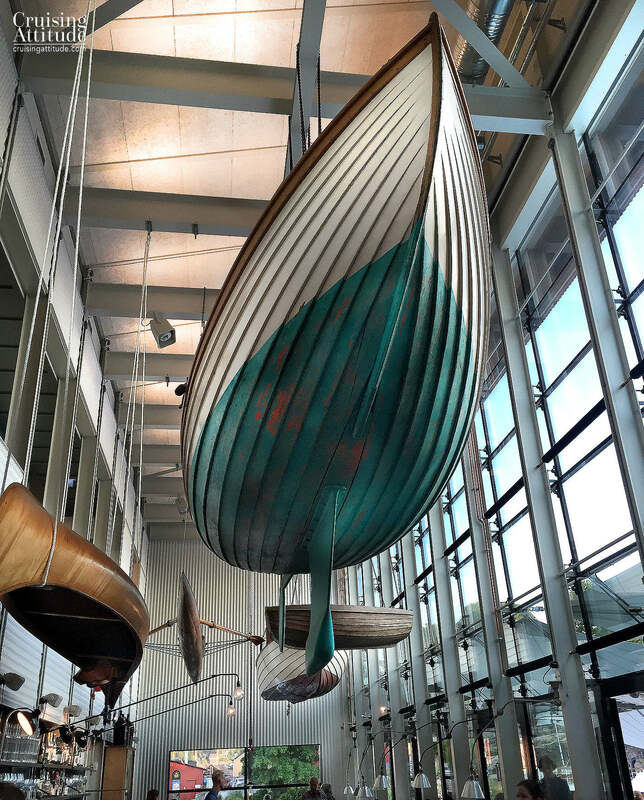 Housed in a beautiful former maritime customs building, the Photography Museum (Fotografiska) is a must-visit if you are at all interested in photography. Some of the world’s most respected photographers and photojournalists have exhibited here. Some names you may recognise are Annie Lebowitz, Herb Ritts, Bryan Adams, and Lennart Nilsson. The restaurant is fabulous here. We really enjoyed the summer terrace as it was a hot and sunny day. It’s an ecological restaurant that put the vegetables and fruits into focus, rather than the meat. In other words, you chose your vegetables first and then the meat or fish you think would go with them. It’s amazing how delicious vegetables can be when you add a bit of creativity! The Kaknäs Tower is a television/radio tower located on Djurgården. I assume it’s not really used for TV and radio anymore as we now have satellite and internet radio and TV. A new restaurant has opened on the 38th floor and there’s now a Sky bar on the top floor (41st). The Sky bar has the best view of Stockholm — it’s 150 meters up. You can see all the way to Lake Mälar towards the west and far out to the archipelago towards the east from here. If you want to take some good photos, you can ask for the key to open small “photography covers” in the protection barrier around the tower. 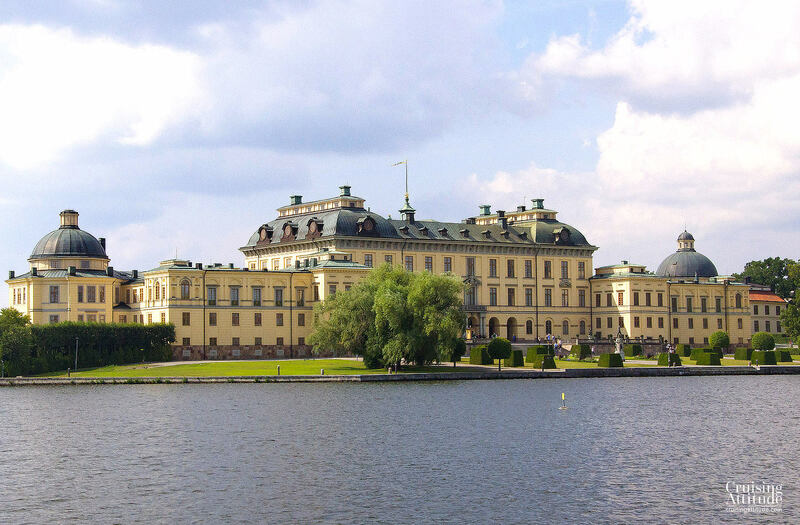 The Drottningholm Palace is where the king and queen really live (the royal castle in the old town is now a museum). As the royal family are housed in the south wing only, the rest of the palace is open to the public as a museum. 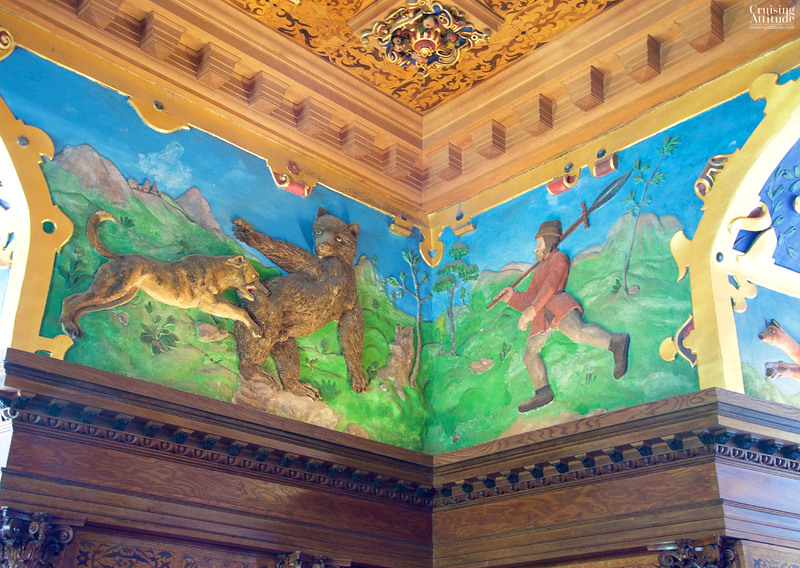 If you’re a history buff or castle enthusiast , you’ll appreciate the well-preserved paintings, furniture, sculptures and architecture of the era. The palace was built during the 1600s by the renowned architect Nicodemus Tessin the Elder, and was subsequently renovated throughout its history. The gardens behind the Palace are huge. The central part is more a french style, quite stylised. The exterior parts were designed as an english park — a romantic countryside with ancient oak trees and small brooks and ponds. It makes you think of Jane Austen and it’s a lovely place for a champagne picnic! 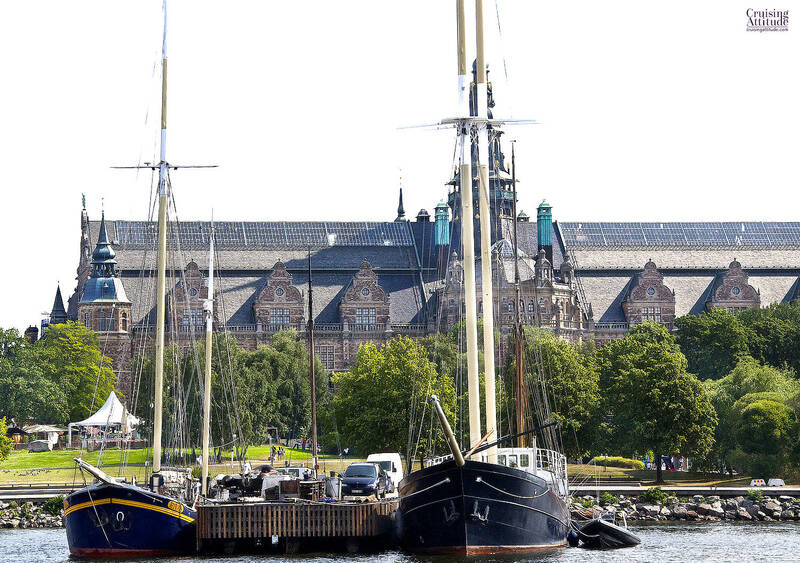 The most pleasant way to get to the Palace is by steamboat (Ströma Kanalbolaget boats leave from the City Hall Quai). If you’re in good shape, it’s also a pleasant bike ride. 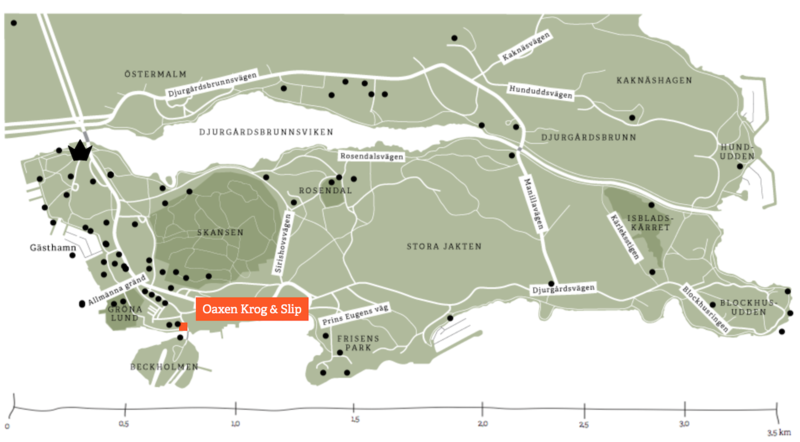 Otherwise, you can take the subway to Brommaplan and then the bus to Drottningholm. See the public transport planner here. The royal castle in the Old Town, is not the most beautiful castle in Europe, but with it’s 600 rooms and several floors, it’s full of things to see. Start with the royal treasury to see crowns, sceptres, swords, ancient coins and the jewels sometimes worn by the queen or the princesses. Then go through the Royal apartments to seen the staterooms used for official events, meetings, banquets and balls. 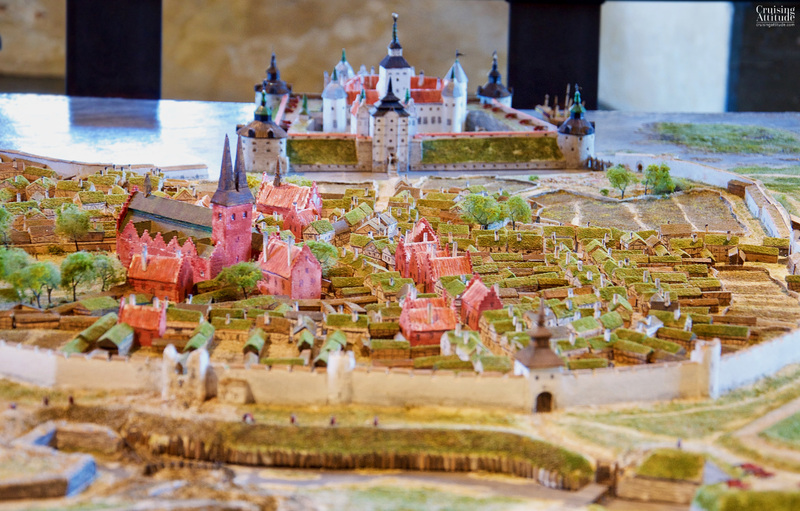 Continue to the The Kronor Museum, when you’ll see models of the original (and more beautiful) original castle. This castle, called “Tre Kronor” (Three Crowns), burned down in a voracious fire in 1697. The Nordic Museum is a stone’s through from the Wasa Marina and the Wasa Museum and is well worth a visit. 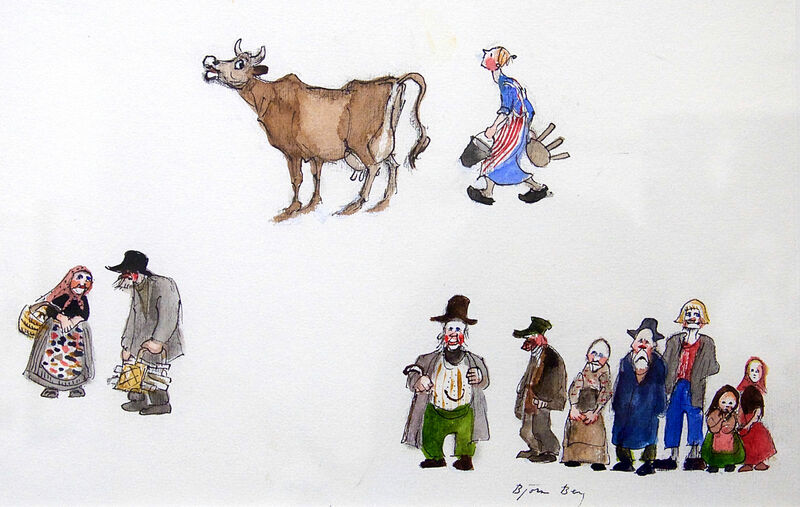 Its exhibitions cover various aspects of the nordic countries’ histories and lifestyles. Exhibitions cover things like clothing styles throughout the ages, arts and crafts, what kinds of food was eaten, housing and the birth of the “peoples’ home” (modern and well-equipped housing for the working class Swedes). There’s also a permanent exhibition covering the history and culture of the Sami people of the north of Norway, Sweden and Finland. The Nordic Museum seen from the water. Jacques and I love to visit aquaria around the world. Though the Aquaria Water Museum isn’t the largest one we’ve ever seen, it’s interesting in that the waters around Sweden are well-covered. You’ll see what lives under your boat! The various marine environments you’ll see here are “the Rainforest”, “the Mangrove”, “Tropical Seas” and the “Nordic Seas”. 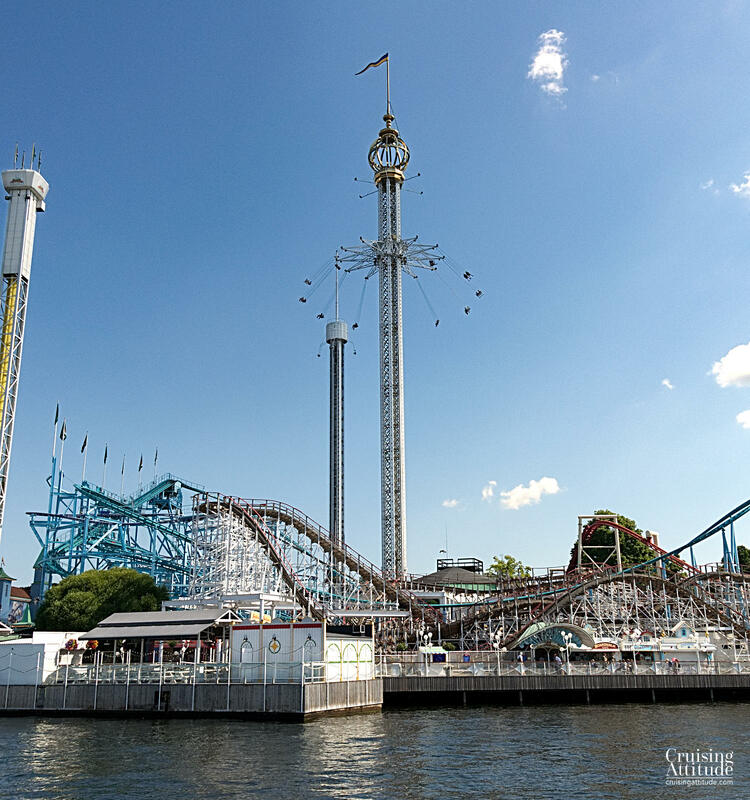 Gröna Lund is a classic park of attractions with rides you see in just about any western country. We are not big fans of this sort of thing, but if you have children or teenagers onboard, they’ll probably want to check it out. There are sometimes great concerts here. Junibacken is the fairytale and folk story world of Astrid Lindgren brought to life for small children. Your kids can visit Pippi Longstocking and Emil from Lönneberga. Perhaps the best way to describe it is “a children’s cultural centre”. There are different play areas and a Story Train, when you get on a train and go through different parts of Astrid Lindgren’s children’s stories, like you would at Disneyland. Have a look at this video if you’re wondering if a visit is a good idea for your children. 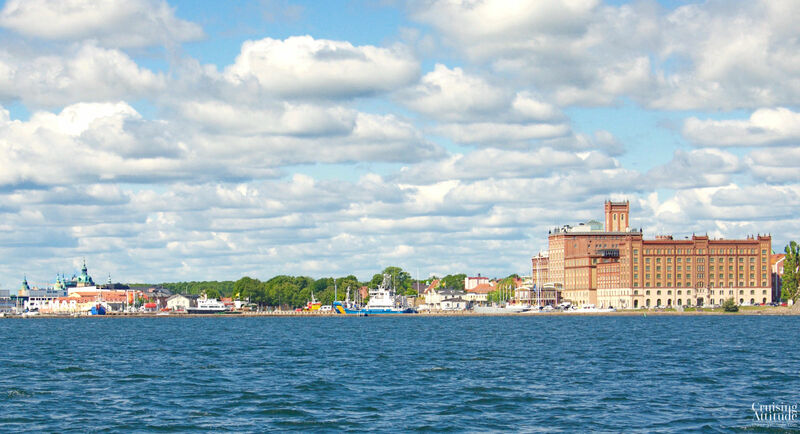 The beautiful city of Kalmar is almost entirely surrounded by water. It was an important trade centre for the Baltic countries throughout the middle ages and into the early modern era. According to Wikipedia, the oldest evidence of the establishment of a town dates from the 11th century. Many of the buildings constructed during this period are still standing, making it a fantastic visit for anyone interested in history or architecture. Even if you aren’t, the city, with its cobblestone streets, charming boutiques, and friendly population make it a “must visit”. 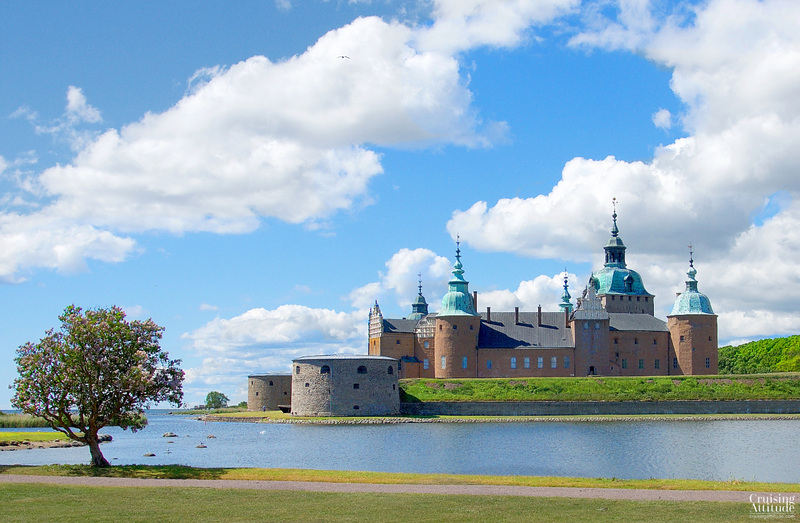 The jewel in the crown of Kalmar is its castle, Kalmar Slott. This fabulous example of medieval architecture stands majestic on its own island. Though the construction of the castle began during the 1100s, it has been renovated many times throughout its history. 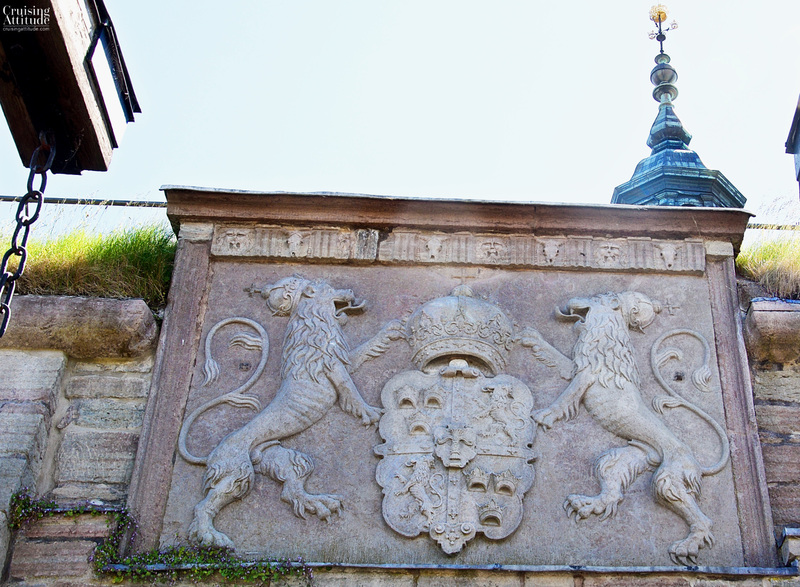 It was a symbol of peace in the 1300s as the treaty called the Kalmar Union was signed here. It united Sweden, Denmark and Norway. The Kalmar Union was dissolved however, in 1523, and a long period of war and bloodshed followed. One of the worst battles was the during the Kalmar War with Denmark-Norway, which took place between 1611 and 1613. The treaty of Roskilde in 1658 marked the end of the worst hostilities and the end of the era of Kalmar as an important military city outpost. We had left Kristianopel early and were aiming for an arrival in Kalmar at about 12.00. We figured that most people who were leaving, will have left by then, and those coming would not arrive for another couple of hours. Although the marina does not take reservations, I called the marina manager about 2 hours before our arrival to ask what the situation was (in other words: “we have a 17 meter long boat — is there a berth free?”). He informed us that there was one berth large enough for Freja was free. 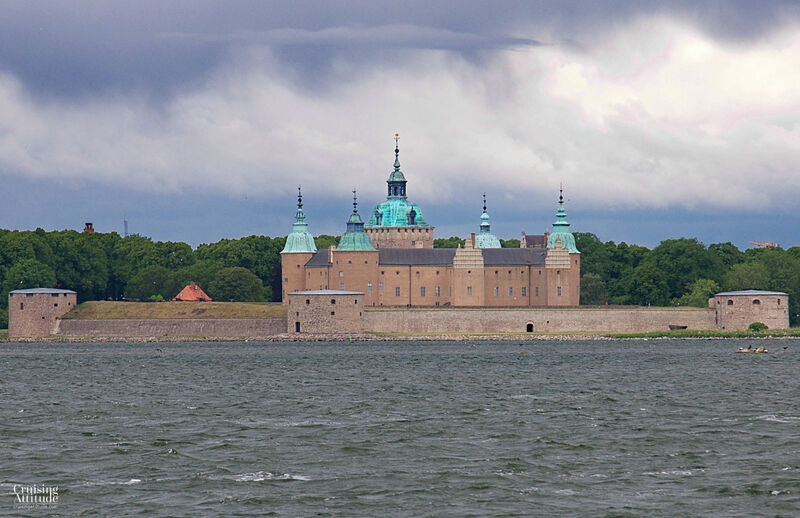 I said we would call back when we passed the Kalmar castle (about 10 minutes before entering the marina channel). When I called the second time, he informed me that a big catamaran, a Catana 54, was in the processing of casting off and that we could take her place. Yay! We got help with our lines from the marina manager, Thomas, and after we finished mooring, I went directly to the marina office, while Jacques took Senna for a walk. The marina office is quite cleverly installed in the tourist office next to the waterfront. 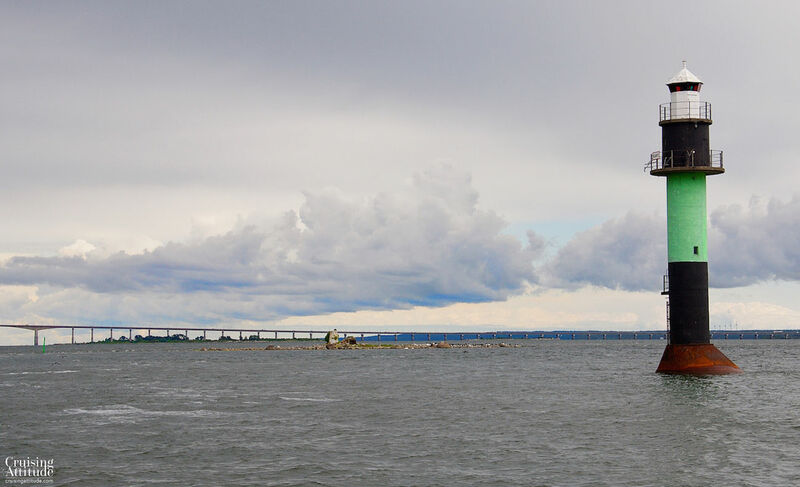 After I paid for a two-night stay, I collected tourist information on Kalmar and the entire southeast coast of Sweden. The tourist office houses a gift/souvenir shop as well, but I didn’t find anything that we really needed for the boat. You know the rule for the boat — anything that comes into the boat will mean something else going off! At least when it comes to things that aren’t a necessity. Speaking of things that are a necessity, we did need a few things from the local chandlery. Baltic Skeppsfournering (Baltic Ship Supply), is one of the largest boat supply shops we’d seen until now. The personnel speak Swedish, English and even excellent German. We then went to the Coop Supermarket in the Baronen shopping mall at the marina to stock up on food for the next week or so. The Coop is actually my least favourite supermarket chain in Sweden. Both the ICA shops and the Hemköp stores are better — with more choice of things we like, especially organic food. But the Coop in Kalmar is right at the marina, so in the interest of convenience, we shopped there. The next morning, we hopped on our bikes to ride over to the castle. It’s 5 minutes from the marina by bicycle, 15 minutes by foot. The gorgeous Kalmar castle, built in the Nordic Renaissance style, was gleaming in the morning sunshine as we approached. The first thing I wanted to do is to try to reserve a table at the castle restaurant that evening. It was Jacques Birthday and the restaurant there has excellent reviews. Success! They had a table for two available. We then went for a tour of the castle itself. We ended up spending about 3 hours — not as part of an organised tour, but on our own. There’s just so much to see and examine, especially if history and architecture are some of your personal interests. 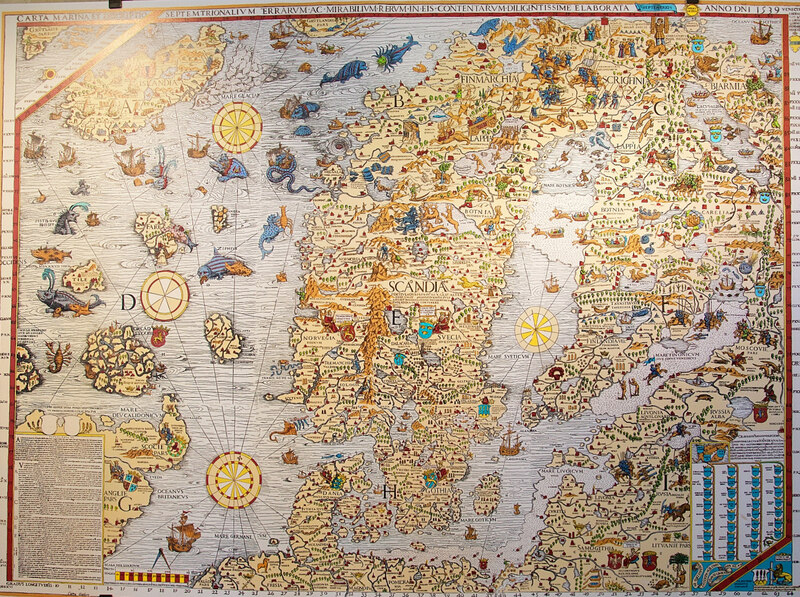 Map of the nordic and Baltic countries back in 1539. Note all of the fascinating sea monsters! Room after fascinating room presented the most amazing craftsmanship — marquetry, embroidery, painting, glass and metalwork. 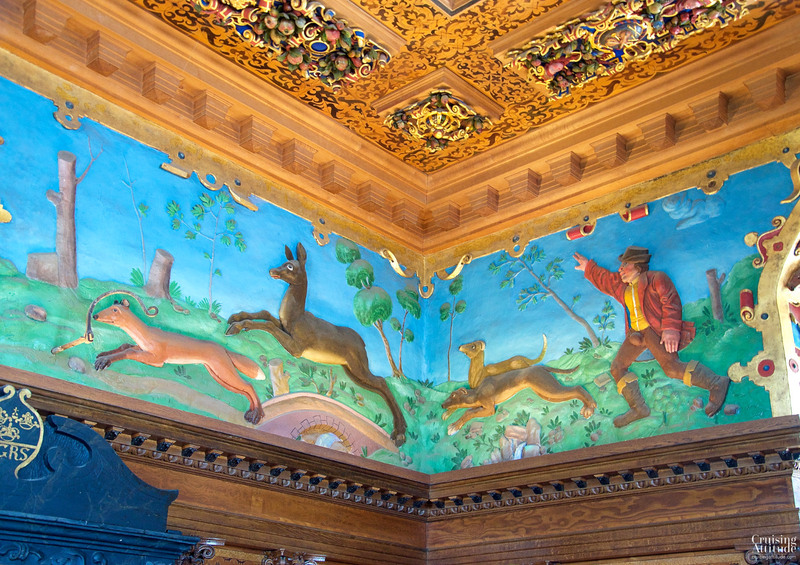 Beautiful scenes depicting hunting are painted and carved into the walls. 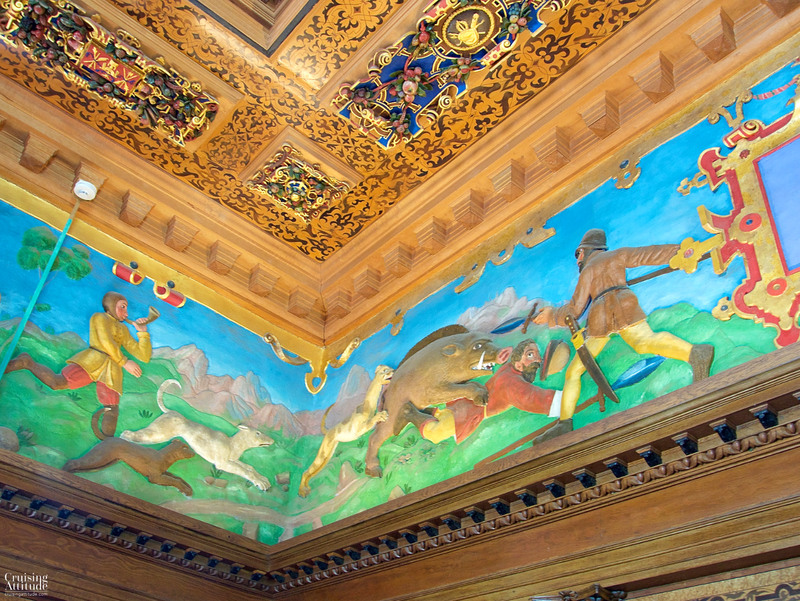 Notice the incredibly intricate ceiling carvings. The two temporary exhibitions were wonderful: one on large glass sculptures and the other on the illustrations of Björn Bergs illustrations of the Emil i Lönneberga children’s books by Astrid Lindgren. Just lovely! One of our favorite rooms in the caste is the banquet hall. 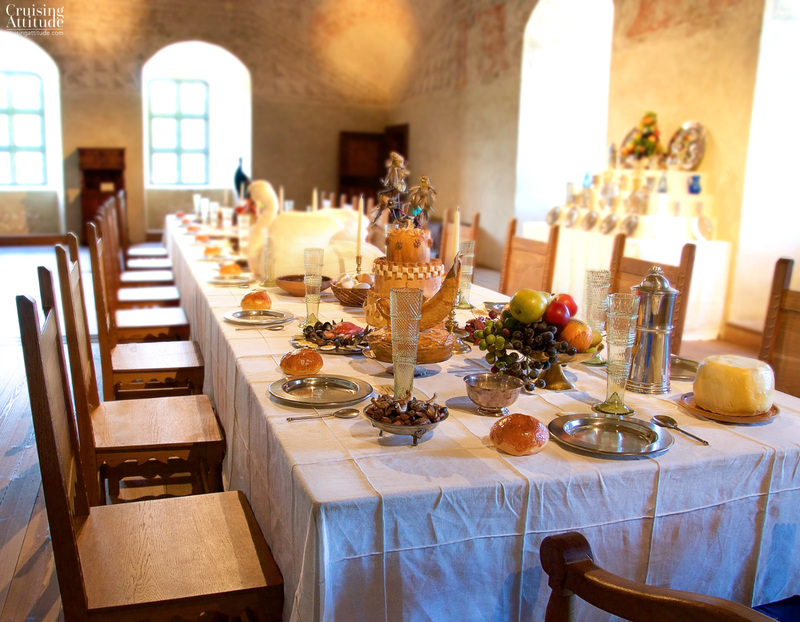 It’s exhibited as fully prepared for a banquet with wax “food” done in the gastronomic style of the period. 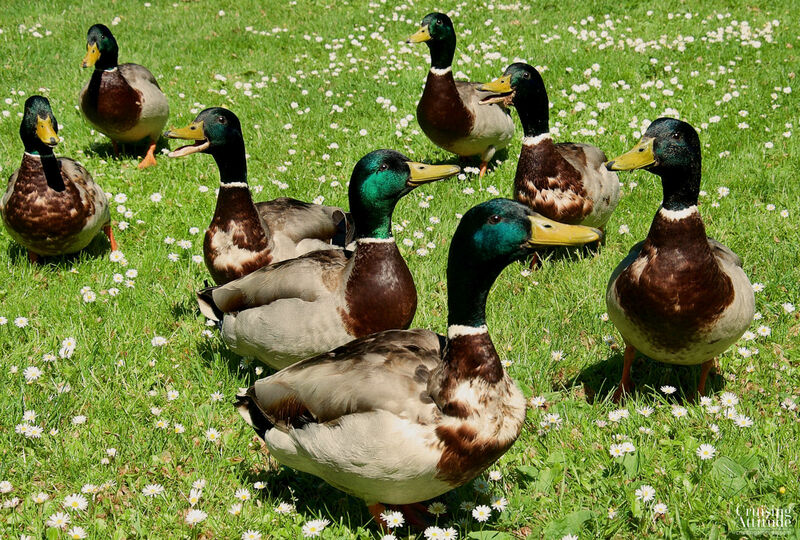 Notice how they used birds and waterfowl as table decorations . Beautiful but horrifying! After our 3 hours at the castle, we rode our bicycles back to the boat and got Senna (our dog) for a walk around town. 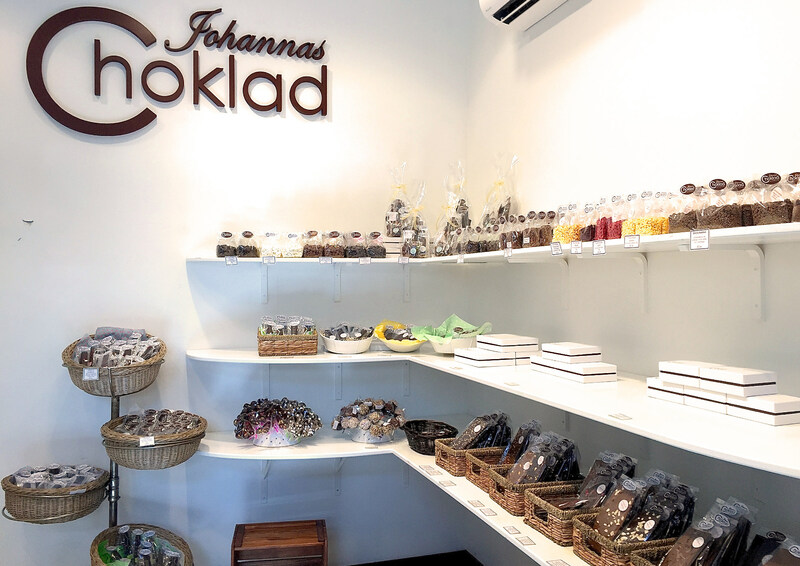 One word of advice — stop at the chocolate maker called Johannas Choklad. They have the best dark chocolate sorbet! 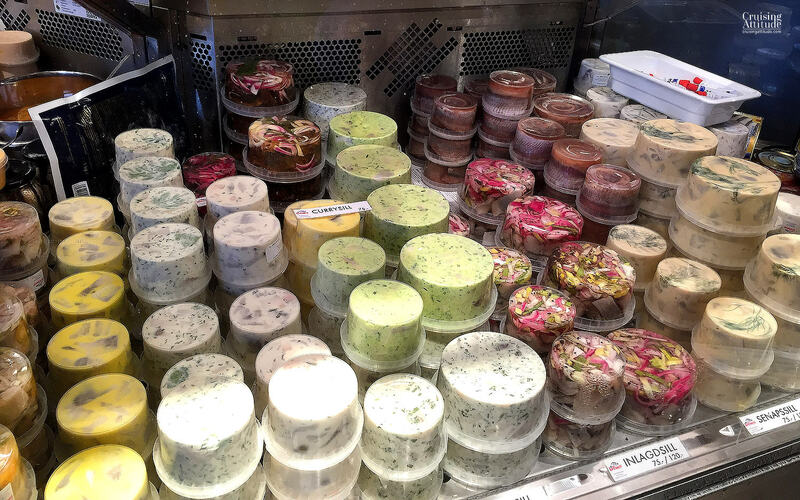 Another boutique we love is Gerdas Te och Kaffehandel. In addition to the many tea and coffee blends on hand, the shop is full of other gourmet foods. We have to be careful not to blow our budget here! 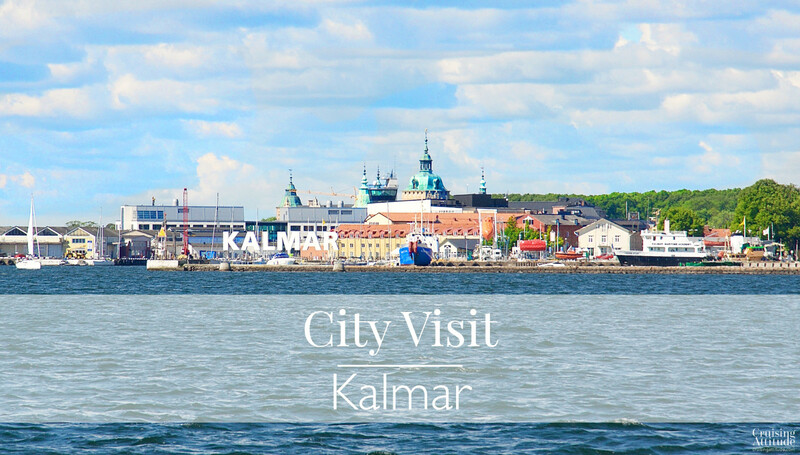 The Kalmar marina is relatively small but it’s almost in the middle of town and a short walk from almost everything you’d want to visit. The service is excellent, and although it’s not possible to reserve a berth (with the exception of a few small berths managed by Dockspot), the manager did find and hold a place for us when we phoned in a couple of hours before arriving. 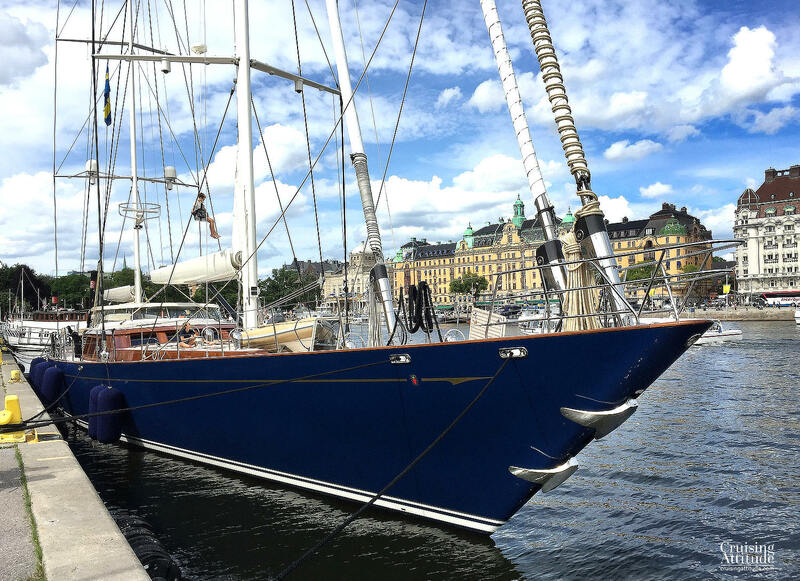 If you’re boat is less than 45 feet, Dockspot has a few berths but be warned that they do charge a commission for the reservation (almost 100 crowns for a boat our size). The state of the toilets, showers and laundry was pretty much spotless. Everything seems to have been recently renovated, and you need a code to enter. You’ll get the code when you pay for your berth. The marina office is housed in the tourist office (located in the one the inner corners of the marina — it’s clearly marked with a huge “Tourist Office” sign). We experienced efficient and friendly service all around. 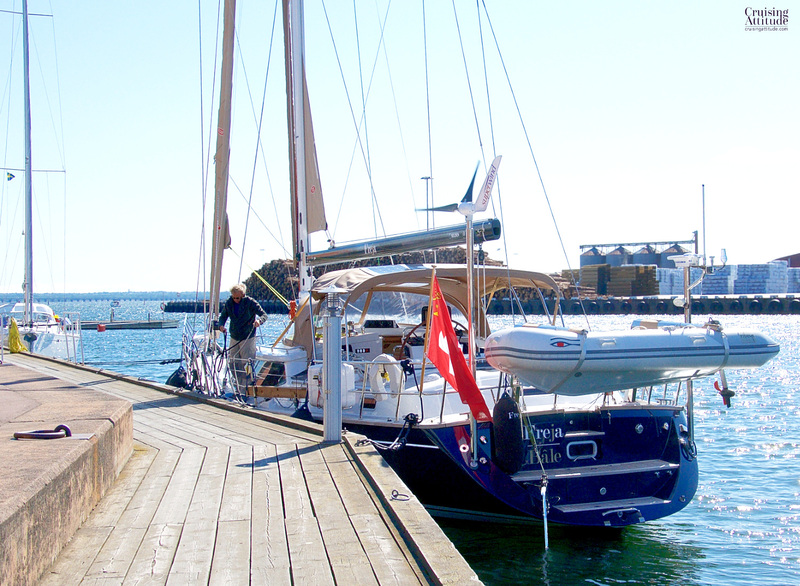 We heartily recommend the Kalmar Marina. 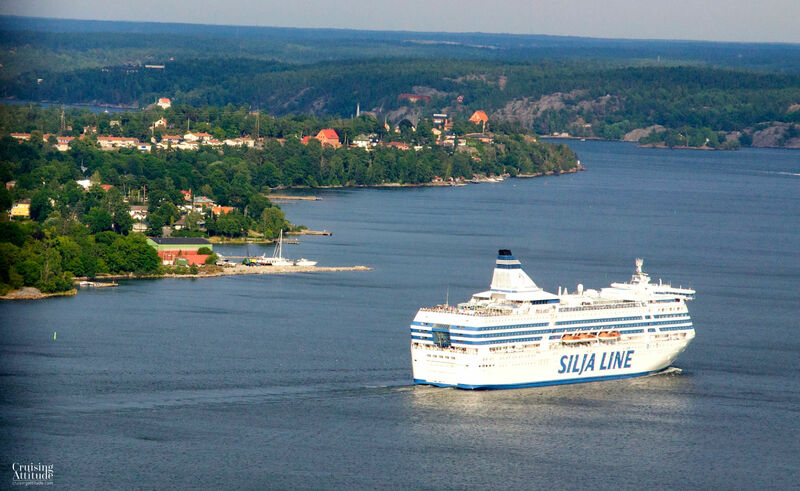 Facilities: Toilets, showers, sauna, washing machines and dryers (10 SEK per load), free WiFi, fresh water, electricity (40 SEK per day), black tank pump-out self-service dock, fuel dock. Our berth in Kalmar. We are lying just in front of the shopping mall “Baronen”. There’s a discount of around 200 SEK if you stay for an entire week. 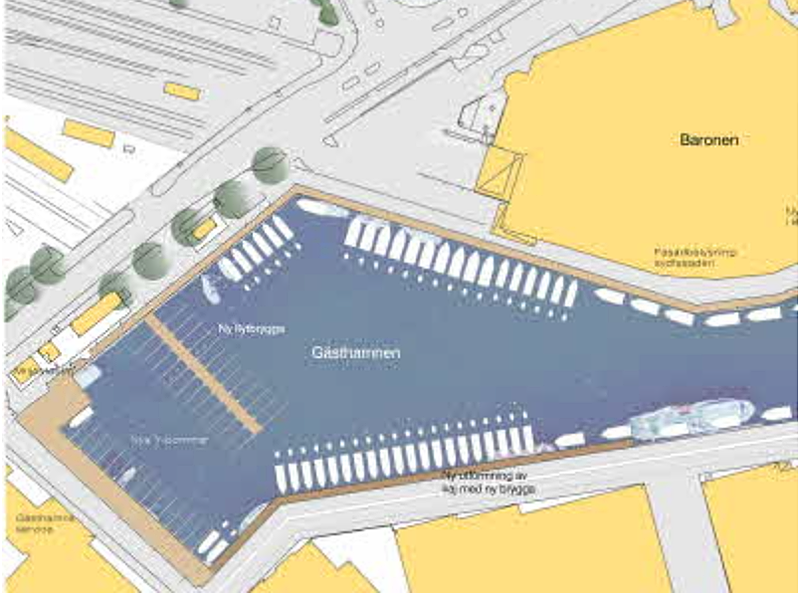 Diagram of Kalmar Marina. Please excuse the bad quality of the image, but it was the only one I could find! Full-service repairs are conveniently located in the marina at Kalmar Marina AB (sails, engine, lift-outs, general maintenance and repairs. Telephone: +46 (0)480-316000. email: service@kalmarmarina.se. They even have indoor winter storage of your boat (up to 60 feet), if you fall in love with sailing on the east coast of Sweden and want to keep your boat here! If you’re in need of spare parts or products for maintenance of your boat, Baltic Skeppsfournering is across the street from the marina office/tourist bureau.